Whether you’re a grower, consultant, supplier, or researcher—you have something in common: your fields vary. The variability may be in water-holding capacity, organic matter, yield potential, nematode pressure, soil pH—or many other possibilities. One thing is certain—managing these fields as if they were uniform is not the best strategy. Before you can manage soil variability— or manage inputs differently, you need to map it and map it with the accuracy and intensity that truly captures the variations. 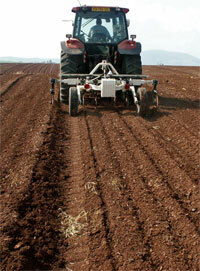 In 1997, Veris Technologies began producing Soil EC Mapping Systems. Today, more fields are mapped using Veris EC equipment than with any other on-the-go soil mapping technology. 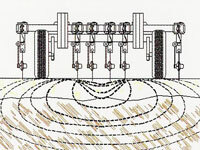 Soil EC is soil electrical conductivity- a measurement of how much electrical current soil can conduct. It's an effective way to map soil texture because smaller soil particles such as clay conduct more current than larger silt and sand particles. Soil EC measurements have been used since the early 1900's--Veris mobilized the process and added GPS. As the Veris EC cart is pulled through the field, one pair of coulter-electrodes injects a known voltage into the soil, while the other coulter-electrodes measure the drop in that voltage. 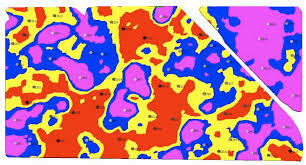 The result: a detailed map of the soil texture variability in the crop rooting zone. Soil EC applications are as varied as the fields they map-fruit growers use them to select root stocks, wheat growers use them to guide deep nitrate sampling, cotton growers use them to variably apply nematicides-the list goes on and on. If soil texture affects your crop and its inputs, soil EC maps are the base layer for precision management of your fields. For more information on EC uses in your area, contact an EC mapper.